RiverBend Motorcoach Resort RV Lot 244 sits on Grand Lake among beautiful, tall palms with a view of the fountain for a tranquil outdoor experience. 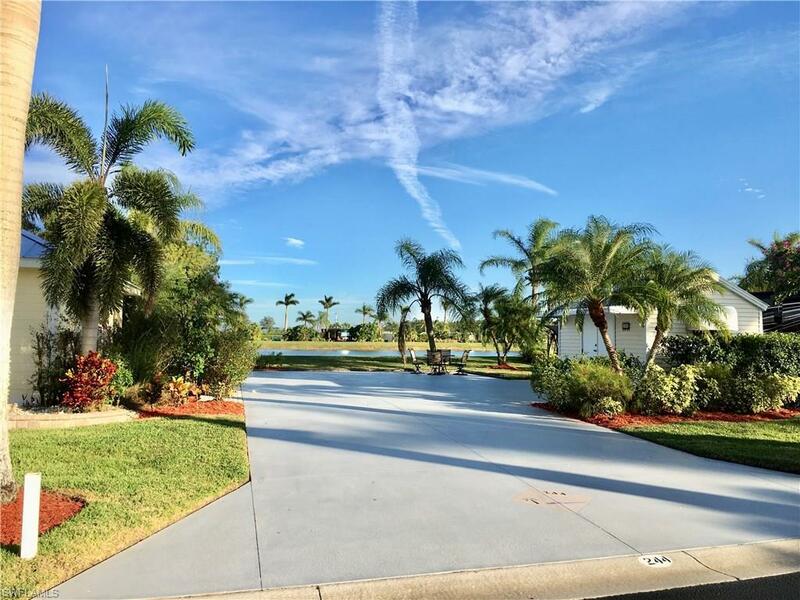 The impressive landscaping and lush, manicured common areas around this lot give it a true tropical SW Florida feel. A quick walk to the Welcome Center and Nature Center gives this lot convenience and easy access to many amenities in the resort. The 10x14 coach house is finished with an awning, wood laminate floors, bathroom, stacked washer/dryer, A/C, ceiling fan and kitchen area providing lots of extra storage options. The resort streets and lots are wide and designed for ease of use. The resort includes over 1000’ of river frontage on the Caloosahatchee River with boat ramp and boat slips. There is a Welcome Center with gated entrance and 2 beautiful clubhouses that include restaurant, full bar, dining areas, billiard room, library, exercise rooms and laundry. RiverBend also has an R/C speedway, railroad village, sailing club, ample trailer and boat storage. Amenities include heated pool, 2 jacuzzis, pickle ball, bocce ball, volleyball, shuffle board, picnic areas, BBQ grills, putting green, horseshoes, games, crafts and a dog park.